Within the realm of alchemy a heavy amount of metaphor is typically used, but Freher’s short tract here is exceptional perhaps for its willingness to state that the spiritual, here, and the chemical are deliberately overlapped- that isn’t to say it’s as transparent as glass; the text specifically (at the end, obviously!) says there is more that could be said, omitted because it’s superfluous- a common cliff-hanger style in literature dealing with alchemy. 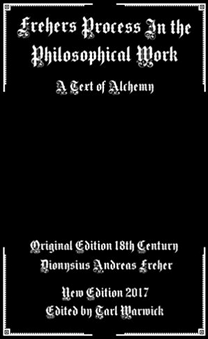 Though short, this work has as much detail on the rudimentary process of refining base materials into the stone of the philosophers (elixir)- here more a spiritual matter than physical, as the Rosarium Philosophorum. Previous Previous post: Dragons and Dragon Lore: Now Available!